Using only positive reinforcement seems like the right thing to do, however telling anyone that is what they should do is possibly setting them up for failure by taking tools off the table that in some circumstances may be required. The world is just not built that way; nor are animals “wired” to operate that way. Aversive stimuli abound in nature and all animals encounter them and learn to avoid them. What I would like to discuss here is a more practical, more achievable goal that will yield results without significantly adversely affecting the relationship between you and your bird. If you visit my Behavior and Training web site you will notice that the banner for each page has a subtitle – “Where least intrusive becomes most effective,” that subtitle is so much more than simply a way to catch your attention, it is a reference to the most ethical way of choosing the strategy used for behavior change and training. The maxim “least intrusive” embodies important principles that as animal caretakers we should follow as closely as possible. Just as in the field of medicine the Hippocratic principle of doing no harm is the basis for the decisions our doctors make when they plan an intervention to correct health issues, we as animal caretakers should adopt a similar principle, that of choosing the least intrusive strategy for behavior change and training. The level of social acceptability. The degree to which the learner maintains control while the intervention is in effect. While the level of social acceptability is a highly personal, ethical judgment, research shows that not only psychologists but also teachers, parents, and children place positive reinforcement strategies ahead of punishment based procedures when considering acceptability. In addition, punishment-based procedures have considerable fall-out, the subject of a future article. Research into the effects of a learner’s control of outcomes shows that when control is removed and the ability to escape aversive stimuli is removed they give up trying to escape. This effect, known as learned helplessness, has been observed in a wide range of species and it often persists even when control is returned. To the greatest extent possible we must empower our birds to be able to use their behavior to control outcomes. This is the function of behavior, to operate on the environment to affect outcomes. A failure to recognize this and the removal of such control may result in one or more undesirable behaviors such as feather picking, unacceptable vocalizations, etc. To return to the original theme of this article, the statement that only positive reinforcement should be used, I would like to change this. Rather than adopting what may well prove to be an impossible or even impractical goal we should set ourselves up for success with our birds with the goal of maintaining the highest possible ratio of positive reinforcement strategies to other more intrusive strategies. Certainly, when considering a strategy for behavior change we should start at the top of the above hierarchy and only proceed to a lower level when we have exhausted the options at the current level. 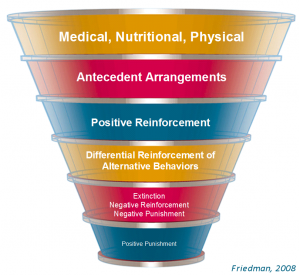 Also note that before we begin to consider positive reinforcement strategies we have two levels of intervention available to us. Attempting to apply a positive reinforcement strategy to address a behavioral issue that has medical/physical roots does not make sense, nor does it address the needs of the bird. In applying the least invasive strategy we will begin to build what Steve Martin calls a “trust account” with our birds in his article “It’s about relationships.” Our goal is to make the maximum number of deposits into that trust account using the strategies from the top of the hierarchy down to positive reinforcement. By keeping these deposits high in number our occasional need and application of lower level strategies will make withdrawals from that account but should nowhere near deplete the account. So let’s not be “Positive Reinforcement Trainers” let’s be “Most Positive, Least Intrusive Trainers.” Our birds will really appreciate it! In doing research online about bird training the visibility of several web sites seems to have rocketed over the last few weeks. Because I like to stay aware of who is doing, saying, and selling what into the companion bird community I often follow these links. What I found increasingly interesting was that many, in fact the majority, of search results led in one or two clicks to the same products, those sold by Bird Tricks. A company that promotes some of the poor training strategies that were the subject of my guest blog on the Best of Flock Parrot Blog last week. To be honest that wasn’t surprising to me, as I have said before I consider them company to be Internet marketing specialists and not bird trainers, so of course they should excel in their field of expertise. What did surprise me however was a more recent development in their marketing strategy. As a part of my research on Bird Tricks marketing strategies I discovered that Womach Productions the owners of the Bird Tricks web site has in fact some 70+ Internet domain names (Internet locations) registered. This one fact alone explains in part how they have raised their Internet visibility. Now there is nothing wrong with this strategy; for anyone whose primary goal is a money making scheme using the Internet it is a great idea. The actual number of domain names registered to Womach Productions may well be even higher because as I researched various web sites I found a new trend, hiding access to the data records of who actually owns the site. In the past this data has been openly available to anyone to access, one simply uses a free tool called “WhoIs”. Indeed if you go to Google and type “WhoIs AvianAmbassadors.com” you will find the full data record available. It is my philosophy that “transparency”, the openness that reveals who owns what, is the ethical way to do business. As I have written in the past, do not trust information from “ducklover488”, if they hide their true identity how can you trust what they say. Not only is our own domain name data openly and freely available but also those of you who receive email about this blog or our Safari newsletter will notice at the bottom of each email there is full contact information. This is a requirement of the mailing company we use (Vertical Response) and one of the reasons we chose to use them. Once again it is the ethical way of doing business as far as I am concerned. Now, I do not know for sure that the hidden domain name records are owned by Womach Productions, however I do know that clicking on almost any link on those anonymous sites leads to … Bird Tricks. Now let me reveal the most disturbing and ethically questionable part of this whole development. Some of these web sites appear to be lists of links to valuable training resources and writings by some of the leading bird trainers and companion parrot advocates in the USA. Amongst them are Barbara Heidenreich, Steve Martin, Dr Susan Friedman, and many others including me. What is ironic is that my article critical of training stategies on the Best of Flock Parrot Blog was referenced! The articles themselves are not available on the web sites, nor are links back to the sources. However if you are searching for these valuable articles you will probably arrive at one of these valueless web sites, just a click away from … Bird Tricks! Now that really is a trick isn’t it? From my perspective the use of my name, intellectual property, and reputation to drive traffic to these sites is completely unethical. I do not and will not support, recommend, or promote Bird Tricks or their products. In the past my approach has been to not mention them because that raises their Internet profile. However, from now on I will be actively mentioning them as I encourage each and every one of you to tell your friends to avoid Bird Tricks and their products. We can use the power of the Internet to protect the intellectual property of those professionals in the bird training world who are motivated to help you and your birds rather than line their own bank accounts using ethically questionable tactics. This latest development once again highlights a subject that I have written about before, and that is separating the noise from the information on the Internet. Once again the golden rule of information validation is the one that should be applied … if the source of the claims made or the identity of the source is hidden then one should always question the information provided. Openness and transparency will always help in deciding what is worth pursuing and what is not. Knowledge is power; so with your new knowledge of the strategies employed by Womach Productions and Bird Tricks you can decide for yourself if you wish to trust the valuable relationship between you and your birds to them and their products. Finally, I encourage everyone to spread the word by sending a link to this blog to all of your friends and colleagues. Peer to peer, friend to friend, one link at a time we can keep the spotlight on these questionable tactics and hopefully reduce the reward that I am sure they get for their efforts. As people who understand the science of behavior we know that behaviors that are not reinforced will eventually go away … now wouldn’t that be an ironic turn of events, the science they obfuscate and ignore being their downfall! Every few months the Internet starts buzzing with a subject that is typically more emotive than most. That subject is wing clipping and it is one of those subjects that eludes logical thought and good judgment. Now you may think that as someone who flies birds on a daily basis I would be solidly in the “never clip” camp. If that is what you think then I have to assume that your point of view is at one extreme of the argument or that perhaps you have never really thought about it in a non-emotional and logical way. My position and that of almost every professional bird trainer I know and respect is that the real answer to clipping is not as clean cut, or black and white, as many might expect. There is no always right answer. The truth of the matter is that the choice to clip wing feathers to prevent or limit flight ability depends entirely upon the individual bird AND owner, a unique combination. It is unfortunate that this choice is more and more becoming a “politically correct” question, and sadly a marketing ploy to sell training materials! My friend and colleague Steve Martin wrote an article about this issue a couple of years back, it expresses what I believe is a well considered position, it does it so well that I don’t propose to reiterate the content here, only to encourage everyone to read the article. I support the positions Steve so eloquently expresses. As I said in the beginning of this article this is a very emotive, maybe the most emotive, issue in the companion parrot community. It is this way I feel because caring owners do become attached to their birds and they are vulnerable to the hyperbole of those at the extremes of the discussion, especially when they are told that their bird will be “happier and healthier” if they don’t clip or “safer” if they do. The problem is that neither extreme view is correct, nor is it based upon facts or science, it is a belief. This reminds me of a quotation that I keep reiterating because it should remind us to be wary of our beliefs as they can, and often do, blind us to the real truth of a situation. To make a bird owner feel guilty because they have a clipped bird when it is the safest, healthiest way they know how to keep that bird is irresponsible and to insist that they allow the bird full flight is to set them up for potential heartbreak. To say that anyone who can not keep a bird flighted should not own a bird is the kind of fanatical point of view that may lead us in the direction of the road to legislation prohibiting keeping bird as pets. The animal rights groups will forever be your friends.